Posted by Jon in NECA, Review with 2 comments. I have to admit that I had my reservations about Otachi. Those reservations never really had to do with the sculpt, or that I thought NECA couldn’t pull it off. I know they can. They’ve proven themselves very capable when it comes to monster action figures. I just had a lot of preorders coming in this month and wasn’t sure if I was ready to pay the $70 or so to own Otachi. However, now that I have him I’m very glad I came to my senses because this is probably NECA’s best release in the Pacific Rim line thus far. Better than Cherno Alpha? Hm. Possibly? But definitely the best Kaiju to date. Otachi comes in a deceptively small box, especially compared to the new tall ones that Kaiju like Axehead and clean Knifehead are packaged in. However, once you undo all of those twist-ties and free her from her cardboard prison you will discover the truth. Otachi is packed with her tail separate from the body. With the tail being almost 9 inches in length; once connected with the body she measures almost 17 inches long. She’s a giant. A beautiful, lovely giant Kaiju. I appreciate that they packed her in a more compact box since it saves me a bit on shipping since I tend to buy most my figures online these days. 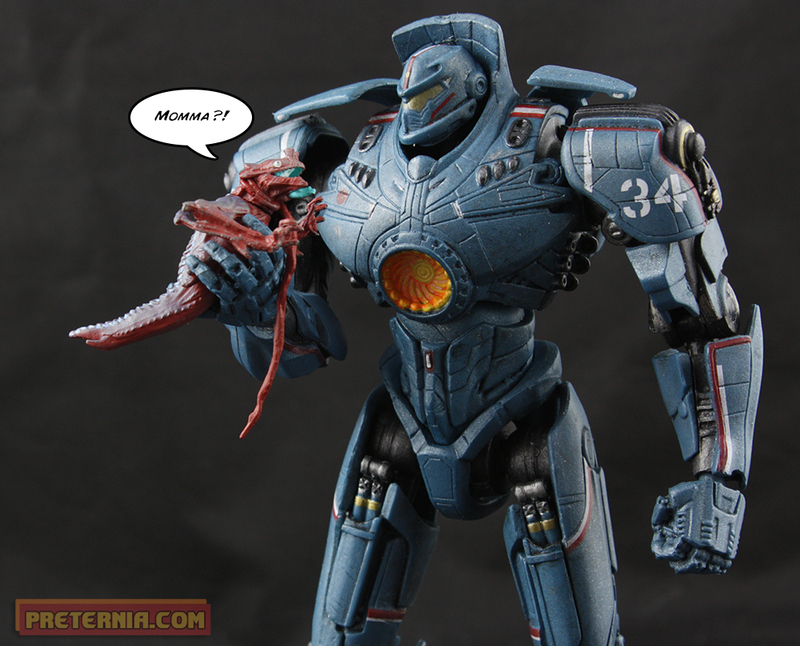 I think I’ve mentioned it before, but NECA seems to be taking some notes from S.H. 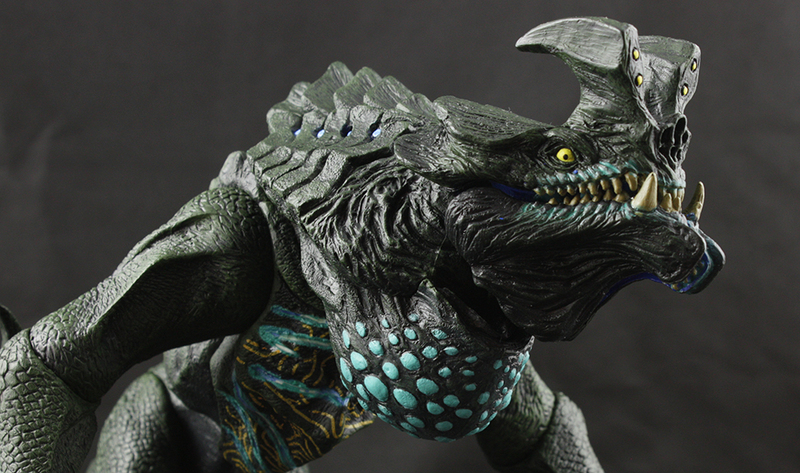 Monsterarts on how to make a great looking and articulated Kaiju. This has definitely been noticeable in their Godzilla line, but now in Otachi I see a lot more of that engineering being used. I was expecting her tail to be bendy, but instead every inch of the tail is segmented into a double ball joint. The three pincers at the end of her tail can also clamp in or be opened up. 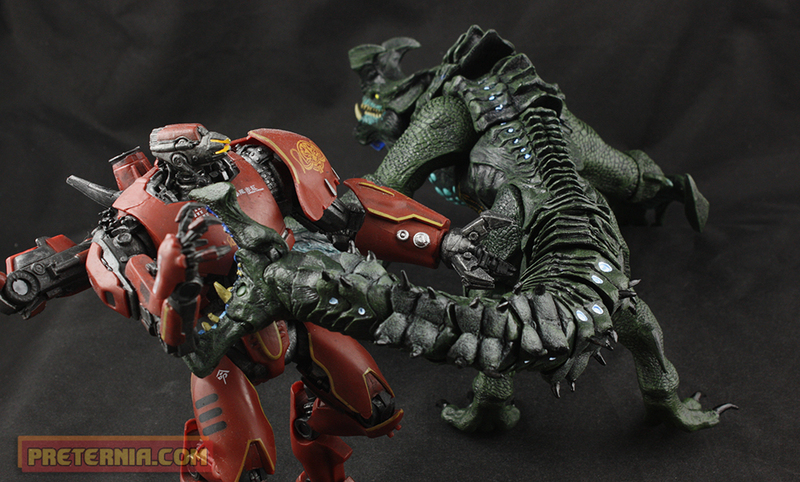 They are also big enough to grab a hold of pretty much an Jaeger in the NECA collection. The ball-jointed articulation scheme runs all the way up through her body to the head. Similar to a Predator, Otachi’s jaw is able to open outward. Opening the mouth exposes her blue inner mouth and tongue. The tongue is actually removable and she comes packed with an alternate “spitting” piece. This will allow you to reenact the scene where she spits acid at Cherno Alpha. There isn’t a huge amount of clearance in the mouth, so I had a hell of a time removing the tongue the first time. Once I got it out I came to find that some of the paint in the peg had dried, sticking it in place pretty well. It was nice that it was holding the tongue in so tightly, but my fingers ache from pulling the damn thing out! The sculpt on this figure is gorgeous and is only helped by the very clean and specific paint details. The blue details in her neck-sack are especially vibrant. Something that doesn’t necessarily bug me, but I do kind of wish they had left out was the battle damaged slashes on her chest area. Not that I think they look bad, but I just like a pristine beast. 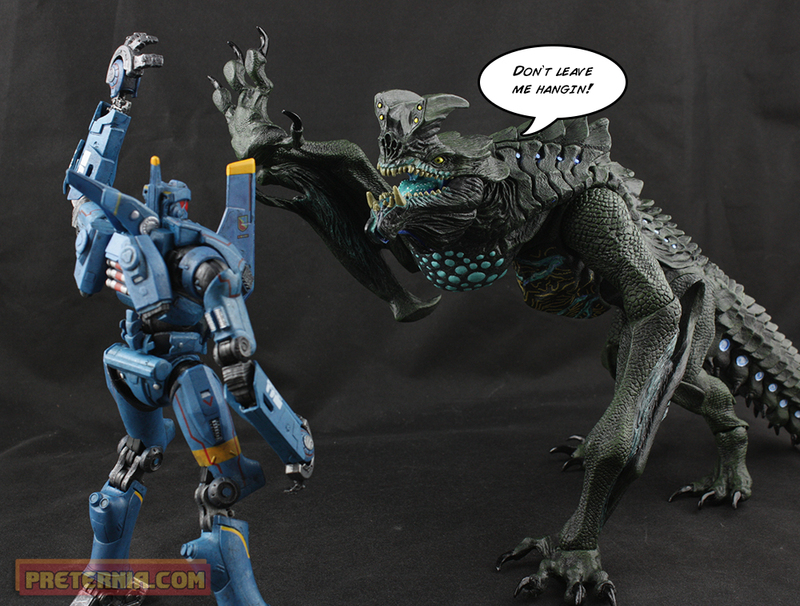 It’s why I went back and bought Knifehead again simply because he didn’t have Kaiju blood all over him. I’m not sure if I’d get a second Otachi just to get a clean chest. I will get a winged one, however, and won’t even think twice about it! This figure is amazingly made and I’d love to see how they would put wings on it for its “second stage” look. I almost forgot! Otachi also comes with an adorable little baby Otachi. The little fellow has three points of articulation along with an umbilical cord wrapped around its neck. It’s a fun little extra that I’m glad they included. Despite my Pacific Rim shelf being completely out of space, I am still really glad I got Otachi. The price is a little daunting at first (around $60 – $70), but once you have the figure in hand you can feel the value … even after just handling the tail I was sold. This giant Kaiju looks great, moves great, and makes for a great display. I love that NECA is constantly finding ways to improve this line. They have come so far since that first wave, and Otachi seems like an evolutionary next step in the Pacific Rim series. 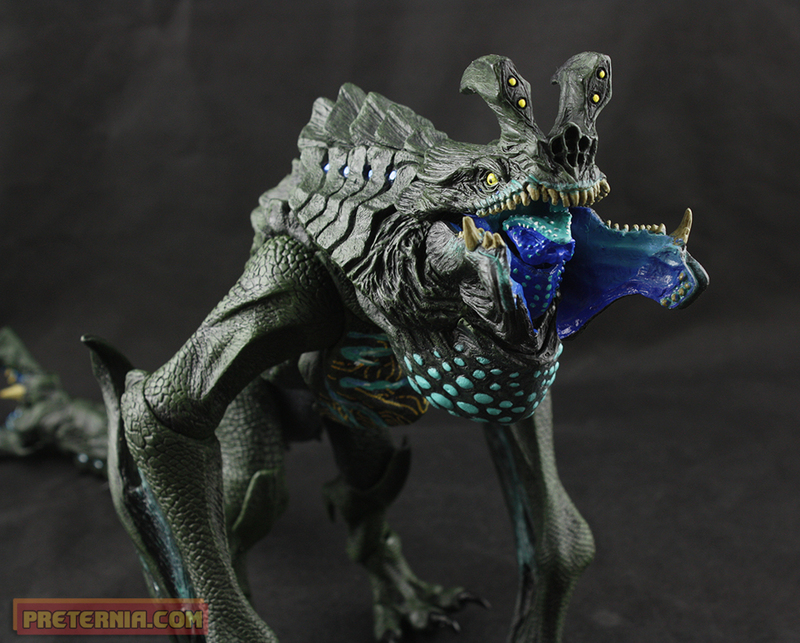 NECA keeps on saying that the line is doing really well, so I hope to see the same quality engineering go into a more complex Kaiju like Slattern. Please make Slattern! And that one that looked like a crocodile for good measure, so I can finish building that final scene. Otachi is just shipping now, so Amazon currently has her in stock. That’s the route I took partially because I’m impatient and also I can’t always trust my local FYE to get these in.